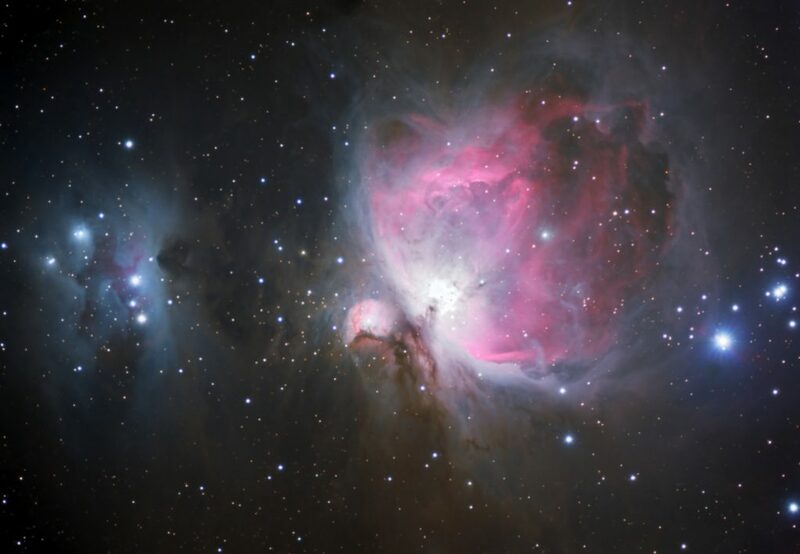 One of the most famous and brightest deep sky objects in our night sky, M42, the Orion Nebula, is located at the “tip of Orion’s Sword” below the famous asterism of Orion’s belt. The Nebula is visible to the naked eye, even in moderate light pollution. It is an intense area of star formation, solar winds, gas, and dust. The image also contains Messier 43, de Mairan’s Nebula. This is the first time photographing this famous object from the Claustonberry Observatory with the ES127 APO and SBIG monochromatic CCD camera. A previous image can be found that utilized the ED80 APO and Canon DSLR. The increased aperture and reduced noise result in far more detail. This image is a mosaic, composed of 2 separate images from the system and combined into one large image. LRGB Image, 2 panel mosaic, 316 minutes total integration.